And do I dare say, that it didn't cost me a thing?!? Yep, I pulled together things I already owned and if I needed a "little something", well then I MADE it! 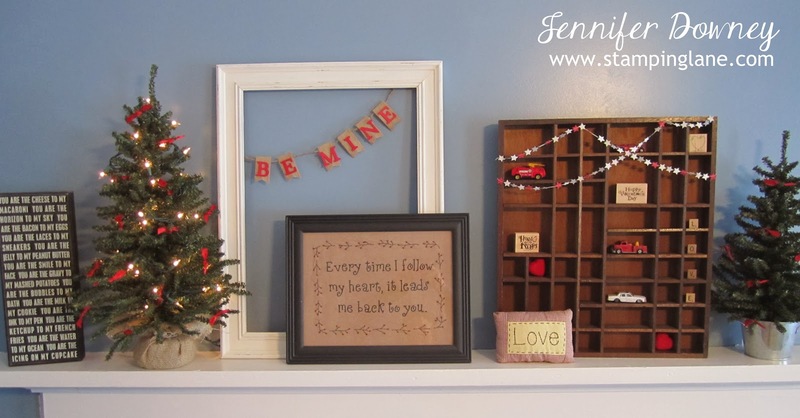 Do you see the little star garland hanging from the wood shadow box? I was one of the winners from Stampin' Up's World Card Making Contest back in October. As my prize, I received the November My Paper Pumpkin kit. Instead of making the cards that came in the kit, I accessorized with it's contents! LOVE IT! And yes, those are some of my valentine stamps in the shadow box as well on display to go with the theme. 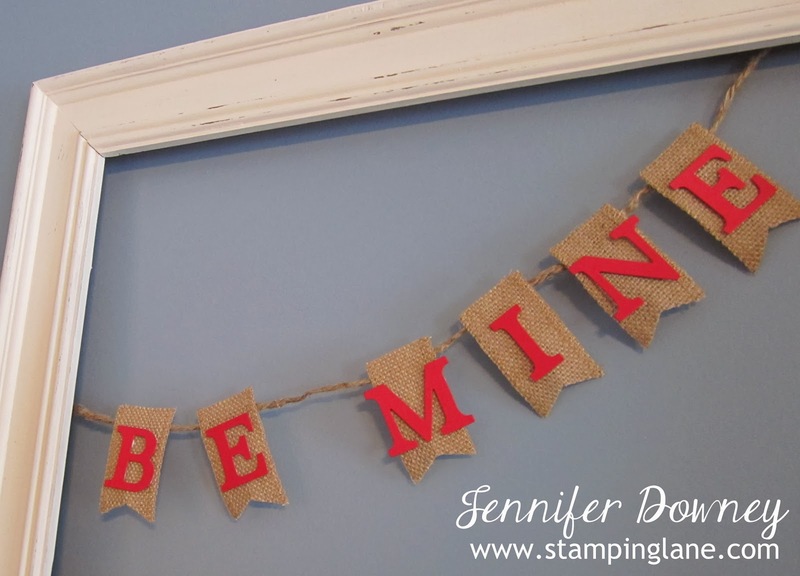 Now we'll take a closer look at the "BE MINE" banner hanging from the white frame because I MADE that too! I used our Burlap Ribbon (which I absolutely adore!) and cut 6 pieces of it all the same length. Then using my scissors I cut a pennant end on each one. I taped (yes, taped! using clear packing tape) each one onto a piece of jute twine I already had. I also used the clear packing tape to adhere the twine onto the back of the frame. That way I can simple take it off an reuse the frame in a different way. I then used my trusty Typeset Alphabet Die and Real Red card stock and die cut all the letters. How did I attach the letters to the Burlap Ribbon you are wondering? With dimensionals! Yep, each letter is popped up on dimensionals! "FANTABULOUS!" I encourage you to look around at your stamping stash and get creative with the items in a different way! Happy Stamping!